The course material was very good and helpful. It helped when writing assessments and coursework. Our teacher, Kay, explained and we went through all homework together to ensure that I fully understood the homework before we went away to do it. The centre is fully equipped with everything we needed to carry out our course. Thoroughly enjoyed this course. The teaching was fantastic and time was taken to explain everything in detail. Kay was very patient in teaching and was helpful at all times. I think the course was excellent, I enjoyed myself throughout. The course offered a great value for the money spent; I think the pricing was perfect in consideration with what was covered. Everything was explained very well, models were readily available which benefited me as I am travelling from far. Parking has always been available at the front of the colleges. And all the staff was very friendly. It was a good experience. Kay teaches everything very well, she had a friendly nature. I think that 8 weeks worked well for the course duration, the coursework and home assignments were slightly more difficult to follow. Overall, I really enjoyed the course. I would recommend this course to anyone else who wants to learn Level 4 laser. I am also doing a level 3 course in the Slough College. I find that Sarah is a great tutor; I think she is lovely and is very supportive. The tutors are great at Beaulaz. They are always there to support you 24/7. They respond to all our emails and help with assignments outside of the classroom. Firstly I think that kay is a perfect teacher. She is so helpful, friendly and a good teacher. I feel completely comfortable with her. I never had to hesitate to ask her any questions. Beaulaz just feels like the perfect setting for me to do my studying! 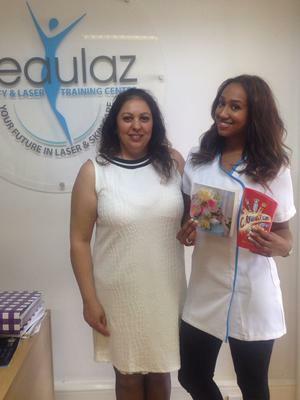 I have just completed a Level 4 course in Laser and IPL. I have previously done two courses here before, this is my third time, and I have noticed exactly how professional Beaulaz is. I have seen a huge improvement since they first opened; this is evident through the hand out styles, the teaching support and just everything. My initial tutor Talha was an equally good teacher, she was so knowledgeable and supportive. I am definitely considering studying advanced electrolysis going into the future. The course is excellent, everyone is so friendly. Halima is a great receptionist she really helped me to get started on this course. Kay is an excellent teacher. Her personality is so friendly, and she was so patient with me and my classmates. I took part in the NVQ Level 4 in Laser and IPL. The course content and handouts were so useful, it was easily accessible,and it was great to be able to use these notes. Beaulaz have excellent machines, both IPL and ND YAG. After completing this course I feel more confident, more experienced and I have now got so much knowledge about laser. I am greatful to Kay, this course was definitely worth it. I find Beaulaz is close to home, the price is very competitive. I have heard about Beaulaz and pass by almost every day. I looked around at other areas but I felt that this college was most convenient, especially as it is within walking distance from my home. The teachers and staff are all friendly and helpful. The teacher Kay is very supportive, the facilities here are good. Everyone holds a very professional attitude from staff members to the tutor. The course was well organised and also well-paced. The literature provided is very informative, easy to understand and very clear. They offer a good range of courses, from Level 2 to Level 4. I am happy that there is always parking in front of the college. My daughter has also done the course, I sent her over first and she seems content. We are both hoping to open our own salon together in the future. I am hoping to continue and do other courses here. And I would recommend the courses to others. Some of the courses that Beaulaz offer are not available at all the other local colleges, especially the Level 4 in Laser and IPL. The college is really nice and spacious; it has everything available that you need. All the resources, access to a printer and literature are to hand. The college is easy to get to and there is a lot of parking nearby. All the staff are fantastic, they have such a helpful and friendly nature. The Level 4 laser and IPL course is great. I originally thought that 8 weeks would not be enough – but so much was covered. Practicing on one another was fantastic; I found that I picked up on things really quick. And I really had fun along the way. The tutor was never frustrated; even though I asked so many questions. The tutor knows her stuff and is very calm and collective. Kay is brilliant. She is so patient and understanding. She was very helpful throughout the course. She is even there to help with assignments. You can email her at any point and she gets back to emails straight away. I have looked around for beauty courses everywhere, and having looked for a few months found that this was the best course available. And I would highly recommend it. I learnt good useful things from the Level 4 Laser and IPL course. I found Kay to be a good teacher, within 8 weeks she covered everything, and it felt as though nothing was missed. I felt the assignments were short, they needed images included too. Everyone in the class helps one another; it is a real team effort. We worked really well together and it was great to have this added support. Kay is friendly and is a good person. I was recommended to come to Beaulaz from a friend, and I am pleased. I find it to be a nice place, it has a great atmosphere and all the staff is very friendly. I was really impressed with the photo rejuvenation technique which was taught in the class. The course is fun and you never get bored. I found that laser is not too difficult; you just need to master the correct technique. I would recommend it to other people and my sister is very keen to join on and start the same course that I have just completed. I have learnt quite a lot here; this course is entirely different from what I have been doing. I have learnt really good client communication skills. I wanted to learn about lasers, I feel much more competent, but I would like to now gain more experience around lasers. The learning is really intensive as we have to practice laser both on our peers and on paying clients. This really helped build our confidence. The assignments really helped as it ensured that we read through our hand outs and ensured that we were applying knowledge from both theory during our practical sessions. Kay is very helpful, she is reliable and friendly. I found her very approachable, no matter how many times you come to her for help she will go out of her way without any complaint. She also helped when we were completing assignments. She keeps an eye on how much you have done. There is a very friendly atmosphere here at Beaulaz. I really enjoyed my 8 weeks here. I am very happy that I have completed this course and so now I am ready to pursue this career. I did not find this college through a friend, I came across the website and I am so pleased that I did. Having completed my Level 4 in Laser and IPL, I have now gone on to recommend my friends. It was just an 8 week course, so it was easy to travel up just once a week. I love and like it here. It is everything that I expected. The course provided all the knowledge that I needed. My tutor Kay is great. She is a confident teacher and is very helpful with everything. She is an asset to the college. I am travelling from far but I will consider studying a level 3 course. Currently I am thinking of expanding my current career as a hairdresser, I work at home and will now look to offer laser hair removal services too. This course has been very helpful to me. I am very happy and can see myself recommending it to so many other people from now. Beaulaz Teacher Kay is brilliant. I loved this course. I love this course and I would do this again. I studied for a Level 4 in Laser and IPL qualification in the slough branch. The course was wonderful, I would recommend this to any beauty therapist who is looking to improve their skills. I didn't know what to expect of the course I wasn't sure if I wanted to do the course or not, but now I've done it I would highly recommend it to anyone. The course content is so rich, all material is provided. The course tutor is very knowledgeable. She has such good teaching skills, she makes it easy for everyone to understand course no matter what there level of knowledge is. From beginners to the more experienced. It was worth all the money that I paid. I do not have any regrets. I was afraid that I would struggle in class, but the tutor Kay was so helpful, she stopped and helped me. She was ready to instruct me through everything. She was very patient throughout the course. There is nothing that I would say is a waste of time in this course, no attempts to fill in any gaps. Every aspect of the course is relevant. I believe almost 100% of the students will pass this course because of how intense the tutor is with every individual student. Overall I felt that 8 weeks laser & Ipl training course was enough time, I missed one of my lessons but Kay was very helpful and recovered what I missed. The lesson hours worked perfect with my lifestyle as I am employed somewhere else. So coming in just once a week was ideal for me. The location of the college was good, I drive to the college and parking was readily available. I found all the staff to be very helpful. It is a great environment for getting to know other students and networking. As a law graduate, this was a completely different path for me to follow. I found everything completely clear. I went straight into a Level 4 laser & Ipl qualification without having obtained Level 2 and 3 before. This was fine as everything was very clear in my classes and I found that the hand-outs were very helpful. I stepped into a different field, but found it easy to understand everything. 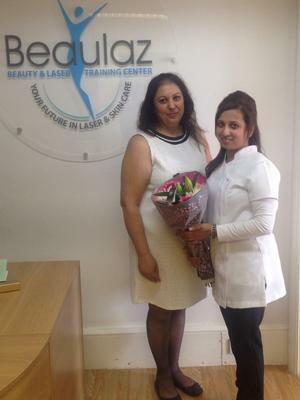 I would definitely recommend Beaulaz Beauty college to others. I feel as though this course has given me all the information I needed in order to now go on and open my own business. I enjoyed doing the course and Kay was very helpful as a tutor. I was totally new in this field and I found the Level 4 course very helpful. Kay was always there to help me. I felt very looked aftered. The academy is a very nice place to learn. Kay as a teacher is a lovely person to work with; very helpful and friendly. I will love to come back to Beaulaz. The course was really good and I thoroughly enjoyed doing it. The centre was welcoming and provided good facilities. I have got lots of help in the form of books and tutoring, regarding my course. I am feeling very confident and knowledgeable. The tutor delivered everything in depth. I attended the 2 day BMLA approved core of knowledge course at the Slough Beaulaz training school. It was a very good course with good quality training manuals and an excellent tutor. The tutor Kay Malhi had vast experience and knowledge and made the whole group feel comfortable with each other. Kay also provided ample opportunity and time to practice on each other without making you feel uncomfortable. I would definitely recommend the course. It was very professionally run, with all the necessary content required to successfully carry out IPL and laser treatment on clients. furthermore there were tips about starting out your own hair removal business.